The course has been measured to UK Athletics standards using the Jones Counter method by a qualified official of the Association of UK Course Measurers. Click here to view the Certificate of Course Accuracy. Distances are marked in KILOMETRES. There is a water station at the 5km point and after the finish line. 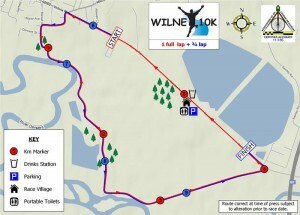 The Wilne 10k road race is possibly the flattest 10k road race in the country and is ideal for those seeking an easy road race or those seeking a personal best time. There is a total of only 5.6 metres between the highest point and the lowest point on the course. Please see the below diagram or click here to download the statistics here. To get to the start of the race, you will need to exit left out of event car park onto Sawley Road and follow the road for 0.3 miles – this makes an ideal final warm-up. From the start line, the route carries on straight until you come to the Victoria Road junction. Taking a left around this junction, you run around Lodge Street which after a right bend turns into South Street. At the end of the road, turn left onto Market Street which leads into Wilne Road. The route goes around three gentle bends before opening out alongside the River Derwent embankment. As long as you have space with other runners around you, try to take the shortest line around these bends as this is the racing line of what the qualified official of the Association of UK Course Measurers would have measured the 10 kilometre course to. The whole route is traffic-free so you do not have to be concerned about oncoming traffic if you take the shortest line on the roads. The route continues around another series of gentle bends then approaches the scenic St. Chad’s Water with St. Chad’s Church opposite. After passing between both of these landmarks, the route then opens out and after about 250 metres, you take a left bend onto Wilne Lane and now you continue along some long straights. Passing the River Derwent again on your right, you continue along Wilne Lane. The hardest section of the course is now by going up a short 20 metre incline and taking a left onto Sawley Road. You then pass the finish line on your right, and remember you would have only done just over 4 kilometres at this point and you have not completed the race. The road gradually drops down towards the Church Wilne Water Sports Club, with the Severn Trent Water reservoirs on your right, and levels out as you pass straight through the start line and enter into your final three-quarters of a lap. The course then retraces the steps as described above until the finish line.